Leído en hootsuite.com . Puedes leer la noticia original aquí. LinkedIn is the world’s largest and most influential professional social network. To help organizations effectively build their presence on this epicenter of networking, we’re excited to release powerful new LinkedIn features in the HootSuite dashboard. 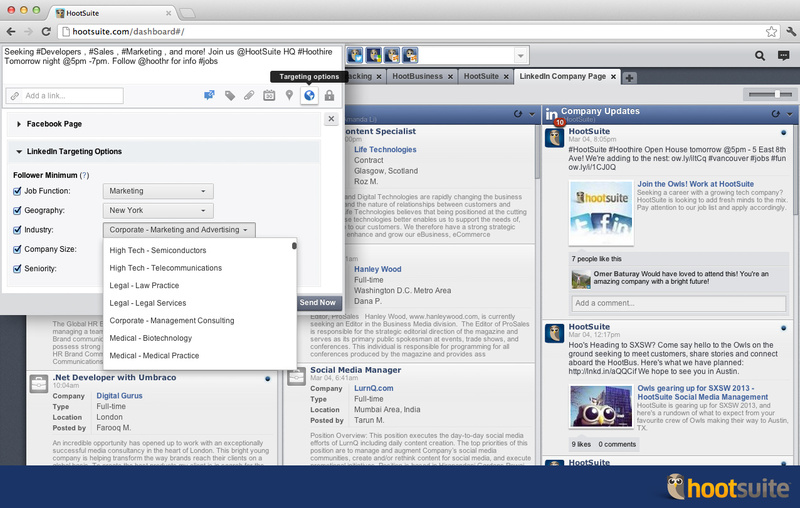 Marketers, HR professionals and community managers using LinkedIn Company Pages can now fine-tune messaging with advanced targeting options (for Enterprise clients), and improve the performance of page and status updates with the introduction of new analytic modules (available to Pro and Enterprise clients). Need to dig deeper and get stats on a per-post basis? 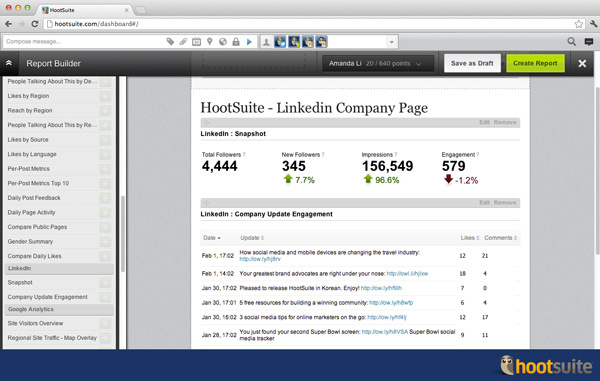 Company Update Engagement modules will allow you to access a granular, side-by-side comparison of post metrics that are not available through native LinkedIn analytics. You can also view the last 3 people who commented on a post, with a link to their user profiles. Sort your popular content by date, by update, or by total number of Likes or Comments. Publishers know that the same content isn’t always relevant to their entire global audience; advanced targeting options allow even the biggest LinkedIn Company Pages to reach followers on a more personal level. For example, marketers can publish content targeting high-level enterprise decision makers in specific geographies, while continuing to release fresh Company Page news and messaging relevant to their entire follower base. With this powerful new targeting, HootSuite Enterprise users can fine-tune messaging and dive deeper into the social power of LinkedIn.